They were so good, that I immediately ate 5 pieces and my scale showed a reduced weight the next morning anyway, which impressed me most. As sweet potatoes are a relevant source of four essential micronutrients: vitamin C, thiamin (a B-vitamin that our nervous systems need to function properly), potassium (also keeps our nervous systems functioning properly and helps to keep our blood pressure healthy) and manganese (important for bone health and protection of our cells from stress damages) they are a real health booster. Additionally, in comparison to white potatoes, they are lower in their glycemic load - 10.5 vs. 13.2 - and have the force to maintain a low blood sugar level and avoid insulin peaks. 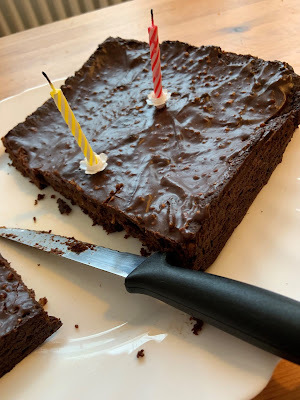 There is a lot of other healthy stuff that makes you satisfied in this brownies as well, like almonds, pure cocoa powder (some interesting benefits are described at https://www.organicfacts.net/health-benefits/other/health-benefits-of-cocoa.html), coconut oil and sugar-free peanut butter. - Preheat your oven to 360°F (180°C). - Grind the oats in a food processor or blender to oatmeal and put it into a bowl. - Peel the sweet potatoes, cut them to small dices and boil or stew them until tender. Put them in the food processor. - Melt the coconut oil in a pot or microwave and pour into the food processor as well. 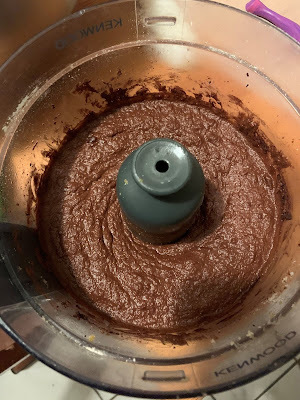 - Add dates, ground almonds, cocoa powder, salt and the espresso and mix until you have a creamy dough (btw. you can eat that dough also as an alternative to chocolate mousse - yummy). - Add oatmeal and blend again. - Grease a baking pan with fat (e.g. coconut oil) and pour the dough into it. - Bake it for approx. 45 to 50 min. in the oven. - Let it cool down for 30 min. and prepare the frosting meanwhile. - For the frosting you have to melt the coconut oil and mix it with the peanut butter, maple sirup and cocoa powder. - Spread the frosting all over the baked part and put the whole thing into the fridge for at least 30 min. - Now you can cut it into pieces and enjoy the best brownies of your life!